The public utilities gave the job for the building of an electric trolleybus system with single pole collector in Eberswalde to the company Brown, Boveri and Cie. AG (BBC) Mannheim/Germany on February, 24th 1939. This job contained the option of the gratuitous retrofitting to the trolleybus system with double pole collectors, if the trolleybus system with single pole collector should not work satisfactorily. 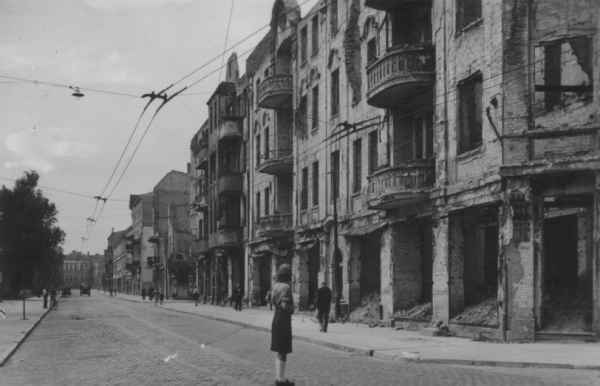 Between February 1939 and April 1940 by the priority of the armaments industry and war- important production were to overcome very many administrative barriers, like allotment of material, use of skilled workers, which were rid of service in the army, and unfortunately also forced laborers etc. The completion of the trolleybus system with single pole collector by the company BBC prepared large problems. On January, 27th 1940 the planning and building permission for the Eberswalde trolleybus system was interim withdrawn. Only a new building application with top priority brought on April, 03rd 1940 a new building permit and consequently the building of the trolleybus system was begun in April 1940. Despite some technical reservations of the Eberswale public utilities the locking decision took place for the building of a trolleybus system with single pole collector on 10 July 1940. Advantages, like more elegant appearance, weight savings and larger mobility were attributed to a trolleybus system with single pole collector. For the Eberswalde trolleybus system gave it already examples in Zwickau/Germany and Gera/ Germany. The designers could thus already fall back on experiences with the building of such systems. The contact wires consisted of copper with a groove broad profile of 80mm2 cross section and were spaced at 200 mm. The following photo was taken up after 1945 (probably 1946) and shows the Neue Kreuz- Straße (today: Friedrich-Ebert-Straße). Very well one can detect the relatively confines 200 mm distance of the contact wires to each other. In order to prevent a tangency of the contact wires, the spacers were built in the center of the pads of the fielded trolleybus overhead system. In curvatures and curves was used flexible mountings, which reduced the high lateral acceleration forces of the 6.1 kg heavy contact head of the single pole collector. The suspension of the contact wires was fastened in the streets of houses by means of wall rosette to the house walls. Before the wall rosette were inserted sound absorbers with BUNA insert (composition rubber). In unoccupied areas tubing masts with arms were set, which were separately dimensioned according to their locations, in order to save raw materials. Old streetcar masts often served as raw material. In the terminal loops in Ostend and at the artillery barracks were used middle masts. Thus a multiplicity of masts could be saved. The photo shows the building of the terminal loop Ostend. Very well you can already detect the used middle mast. The isolation of the trolleybus overhead system was executed doubly. Furthermore on the individual overhead system paragraph were inserted shorted switches to heating-up the contact wires. Before beginning of operation in winter the western or eastern half of the trolleybus overhead system was heated successively, in each case 20 min long, with an amperage by 700 - 800 A and with a voltage by 370 V. That corresponded to a cross section load from 4,5 to 5 A/mm2. In addition once the shorted switch, which is situated in the west or the east of the trolleybus overhead system, was inserted between plus and minus contact wire. The heating-up of the contact wires served for the removal of hoarfrost and ice formations and in the long run for the increase of the reliability. By heating-up the wear of the slide insert of contact head of the current collector could be reduced. Antiaircraft interests played likewise a prominent role. An arc between contact head and contact wire would have delivered a well recognizable target for adversarial bombings. The trolleybus overhead system with single pole collector was quite sensitive due to the cross beam form of the contact head to derailing with all its consequences, like damage of the trolleybus overhead system etc. Constantly one operated on the improvement of the contact heads. In January 1941 was tested a new test model with very good results. The new contact head weighed only 4.6 kg, was thus easier, had instead of guide rollers slip pieces and was new formed. The new figuration should prevent a getting stuck at the contact wire when derailing. The photo shows the improved contact head of the single pole collector of the Eberswalde trolleybus system. The photo was taken up by the company BBC. Since crossings and switches were not constructive sophisticated, one waived their installation. At the branches to the depot and to the artillery barracks the conductor allocated the single pole collector by hand. The double-tracked route system has a length of 6,1 km including the access road to the depot Bergerstraße. 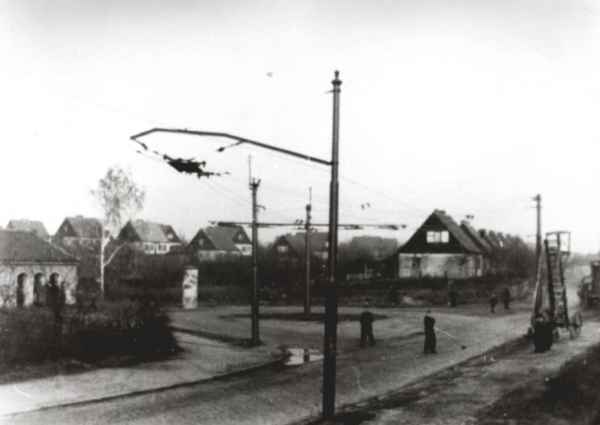 The double-tracked route ran of Westend over Boldtstraße, Kleinbahnhof, Hauptbahnhof, market, cemetery, Saarstraße to the suburban settlement Ostend. At the crossing Freienwalder Straße/SaarStraße was a double-tracked branch to the artillery barracks in direction to Sommerfelde.